A small moisture problem in crawl spaces or in the basement might seem like a minor issue but wait until molds and mildew appear and the problem can quickly escalate to unhealthy levels. Molds like to grow in a moist environment and unless you do something about the moisture levels, they will never stop growing and spreading. Thankfully, there are 30-pint dehumidifiers we can turn to for such a purpose. These are more portable dehumidifiers designed to work in smaller spaces such as basements and crawl spaces. They also effectively get rid of the volume of water in these spaces. We checked out the best 30-pint dehumidifiers out in the market today and curated those that do not just look good but can also bring durability, good dehumidifying benefits and price to the table. Find out what products we recommend below. Why Choose a 30 Pint Dehumidifier? When you check out different home dehumidifiers today, you will come across different sizes of dehumidifiers. Why should you choose the 30-pint ones? What makes them different? One of their selling points is their portable size. Because these are small and compact dehumidifiers, they can be easily installed in a small space where there is excess moisture in the air such as the basement or crawl spaces like the attic. It can also easily be integrated in a spare bathroom or the garage. It is so portable, you can take it anywhere you like and install it in any area of your home that needs moisture control. The size of these dehumidifiers is also just right in collecting moisture from the air without you stopping constantly to empty out the tank. You might have to do that just once or twice a day, which that isn’t too much of a bother. They can also be fitted with a hose, to continuously drain out water. We also recommend these portable dehumidifiers for mobile or recreational homes where a big dehumidifier might be too clunky and space-consuming to use. If you have a small to large-sized rooms that need moisture control, get this one. It is a nice and sleek-looking appliance that you can easily prop in a corner and forget. It blends in nicely with your other home décor because of how well-designed this is. It runs continuously until it reaches full capacity and then it automatically shuts off for safety. One remarkable feature of this dehumidifier is its gravity-fed drain hose. If you don’t want to stop to drain the machine yourself, you can use this feature, so that it continuously drains water. Also, if you have a moldy smell problem in the room, use its Turbo mode function to rapidly circulate air and get rid of odor. This dehumidifier has 3 liters of water tank capacity, just right in getting rid of the moisture from most small bedrooms. It can accommodate the moisture control needs of up to 1,000 square feet of bedroom sizes. It is energy-star certified. You can be assured that it won’t make that much of a difference in your energy consumption. It improves indoor air quality. Say goodbye to allergy attacks. It is easy to clean. Just wipe the tank once every 2 weeks and clean the filter once a month. This unit comes with 6 settings, so you can choose the best dehumidifying mode for your home. It also has a 24-hour timer. It beeps if the tank is full. It comes with all the features you might need in a dehumidifier such as a defrost function and an automatic restart function. This is easy to move around because of its wheels. Some said they had to change the tank 3-4 times a day because of how powerfully it gets rid of moisture in the air. Some also said this can be a bit noisy to run. This might be a compact dehumidifier but it’s definitely not small when it comes to power. It can remove excess moisture in spaces of up to 2,000 square feet in size. With just 30 pounds of weight, you can move it from one space to another with ease. It is also aided by casters for easier transport. The 1.3 gallons of tank capacity is big enough to fill up water in a day. There is an automatic shut off feature that detects when the tank is already full. You can also connect it to an external hose if you prefer continuous draining. Enjoy its easy-to-use functions. The LCD interface is simple to understand. It has all the information you need. It is quite lightweight. The casters also make this easier to move around. The operations for this one is simple to use and understand. It comes with a 6-foot long cord. No need to use an extension cord. You can choose between 2 fan speeds to get rid of the moldy smell in a space. It has a 24-hour timer option. You can easily clean this. The filter is washable. There is a frost sensor to prevent the coils from freezing up when installed in colder rooms. This isn’t completely quiet. It has a sound similar to a window type A/C. With a large tank capacity of 2L, this will surely get rid of moisture in the air without needing to empty it out often. It makes use of compressor technology for more suction power. It also boasts of whisper-quiet operations. With only 45 dB of noise, this will not disturb the household while it is running. It works in getting rid of moisture from small to medium-sized rooms. It can accommodate up to 200 square feet of space. The whisper-soft operations make this a good choice for smaller homes as it won’t disturb the household. It comes with casters for easier transport of the unit. The touch screen feature is easy to use. Set the humidity level you prefer. With its compressor technology, you can be assured that it will run efficiently. The tank is accessible. You can empty it out with ease. It automatically shuts off once the tank is full. It is more affordable than other dehumidifiers out there. Some said they had issues with a faulty dehumidifier after a few weeks of usage, but this can be covered by the warranty. You won’t notice this dehumidifier running because of how quietly it operates. At only 48 decibels, you can go on with your life as if this isn’t running in one corner of the house. All the information you need to see are displayed on its LED Display Screen. Use that to program the settings of your dehumidifier as well. It features a spill-resistant bucket that holds all the excess moisture in the air effectively. You will like how this dehumidifier runs quietly. It’s just the perfect size for a basement. The drain bucket is ergonomically-designed. When you need to empty it out, just take it out with ease. It has a spill-proof design, which is convenient to use. In case of a power outage, use its power outage restart function. It is easy to clean as well. The filter can last for up to 250 hours of operations before it needs to be cleaned. It is a bit expensive than other dehumidifiers out there. This dehumidifier ensures that more excess moisture will be pulled out of the air with its 4 gallons of tank capacity. Let it run continuously until it is full. It will automatically shut off once the tank has reached full capacity. It features Turbo Mode that can get rid of the unwanted smell in the air. It also works in getting rid of odors and allergens, thereby improving indoor air quality. Has a good tank capacity. It works in pulling excess moisture from the air. The design is nice and compact. You can easily transport it, thanks to its casters. Has nice and easy to use controls. 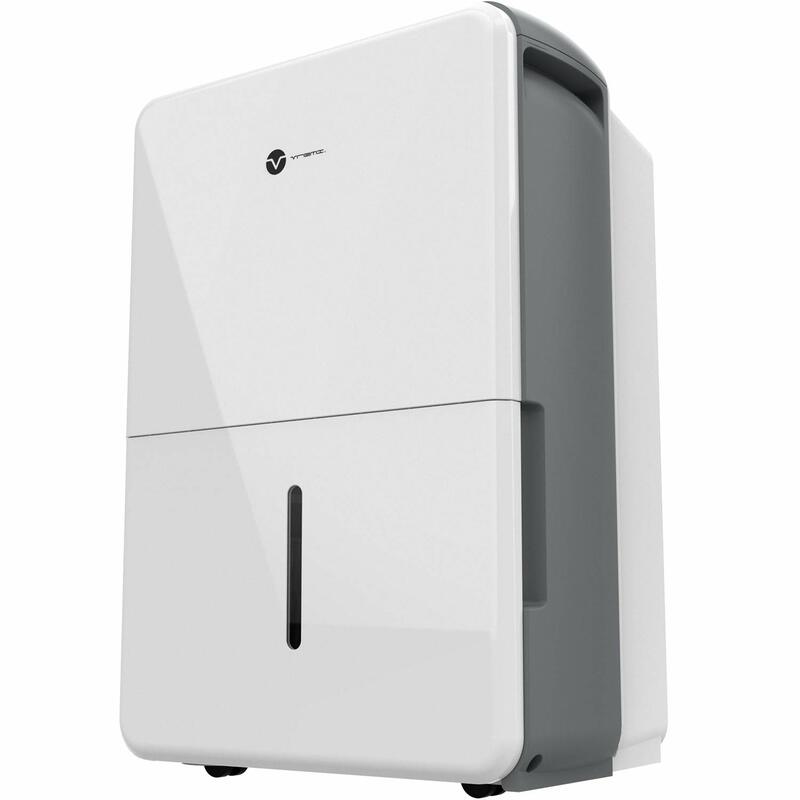 Gets the Job Done: hOmeLabs 30 Pint Dehumidifier. This dehumidifier is a straightforward machine with functions that get the job done fast. If you like one with all the features you need, consider this choice. Easy to Use: Ivation 30 Pint Energy Star Dehumidifier. This is one of the best dehumidifiers out there because of how easy it is to use. The controls are all located in one area and all the information you might need are all in there. Quiet Operations: Eurgeen Touch Screen Dehumidifier. If you don’t like to be disturbed by a noisy unit, try this one. It has whisper-quiet operations that you can rely on to get rid of excess moisture in the air without disturbing the entire household. Powerful System: Tosot 30 Pint Dehumidifier. If you like something that truly gets rid of moisture in the air even in bigger rooms, this is a good option for you. Pulls More Moisture: Vremi 30 Pint Portable Dehumidifier. This is a workhorse when it comes to pulling more moisture from the air. And because it has a larger tank capacity, it works in collecting more moisture. We’ve tried several models and we think the best 30 pint dehumidifier has to be the Ivation. Energy Star rated and offering powerful performance, it’ll remove excess moisture from your air in no time. 1. Look for those with easy-to-use controls and systems. The last thing you would want is to spend needless amount of time tinkering with your dehumidifier. You would want to get a dehumidifier with advanced features but not so advanced that it will take a genius to figure out how to use it. Choose those with simpler knobs or control system, so you can easily figure out how to use them. Pick a dehumidifier that will allow you to control the moisture settings. While it is good to have a dehumidifier to get rid of excess moisture, you don’t want too much moisture to be extracted from the air, else the air would become too dry. This can be bad if there are living things in the room such as potted plants. That said, look for a dehumidifier that can allow you to control its settings and set the moisture level you prefer. 3. Look for automatic start and shut-off function. Look for a dehumidifier that automatically restarts in case it gets accidentally turned off. In case you experience a power outage, the dehumidifier will automatically restart, so even if you forget about it, it will still work in managing the humidity levels in your house. An automatic shut-off function also comes handy. In case the dehumidifier topples over, it will shut off automatically to prevent malfunctioning. It will also automatically shut off once it reaches maximum capacity. 4. Pick those that have sensors. These sensors are designed to determine if the area is too cold. In freezing temperatures, the coils in the dehumidifier might freeze and will cause the entire machine to stop working entirely. But through the sensors, it will detect if the temperature is not conducive and shut down in case it gets too cold. 5. Choose those that you can easily prop on a surface. When using it in a space where it will be exposed to guests, make sure it doesn’t look like an eyesore. It should still be well-designed that it blends in seamlessly with your other appliances. Also make sure the dehumidifier stands solidly on a counter space and it has a nice weight that will prevent it from toppling over easily. Since you will have the dehumidifier running all day or all night, it needs to have a good energy star rating, so it won’t consume too much electricity. These are some of the things you should consider when buying a portable dehumidifier for your home. Make sure you know which dehumidifiers are suitable for different types of your residential or commercial property. Check out our homepage to read more reviews and get more product recommendations.